Siamese cats are commonly depicted cats in western media. Because of its distinctive appearance, Siamese cats are well known throughout most of the world. Beyond appearance, Siamese cats make terrific pets. They are famous for being loyal, intelligent, and playful creatures. In this article we will talk about what you should factor going into purchasing a Siamese cat, and the benefits you will receive from life with a Siamese cat. Siamese cats have a distinctive breed history. First described in texts written in the 18th century, the first documented Siamese cat to reach America was one given to president Rutherford B. Hayes in 1878. 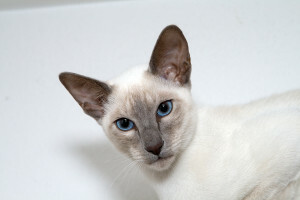 Given by the American Consul in Bangkok, it was given the name “Siam.” In similar circumstances, a pair of breeding Siamese cats was brought to Britain by the British Consulate in Bangkok. As Siamese cats were bred, they grew longer and more angular, slowly forming the distinctive features that we associate Siamese cats with today. Today show cats are valued for having extremely exaggerated forms of these features. Today’s Siamese cats are marked with a distinctive appearance. They feature large, offset ears and angular pointed faces. The stereotypical purebred Siamese cat as an extremely slender and long body. Because Siamese cats have a form of albinism, they tend to be while with black splotches on all the extremities such as the feet and head. Siamese cats have had a few features that we considered detrimental that have been bred out over the years. For years Siamese cats had kinks in their tails, until it was successfully eradicated. This kinked-tail trait can still be seen in the street cats of Siam however. Siamese cats also used to be commonly cross-eyed, although this has also largely been bred out. Siamese cats are fickle cats however, and their health must be monitored closely. With good care, the average lifespan of the Siamese cat being around 10 to 12.5 years. Siamese cats typically die from mammary tumors, or neoplasms. The best way to make sure your cat is at optimal health is to make sure you are regularly bringing it in for a checkup with your vet. Your vet will alert you to health problems ahead of time, allowing you to give the best life you can to your cherished pet. Next post: How Long Do Cats Live?